Years ago I used to buy a Torta, which was an Italian appetizer, or layered treat. 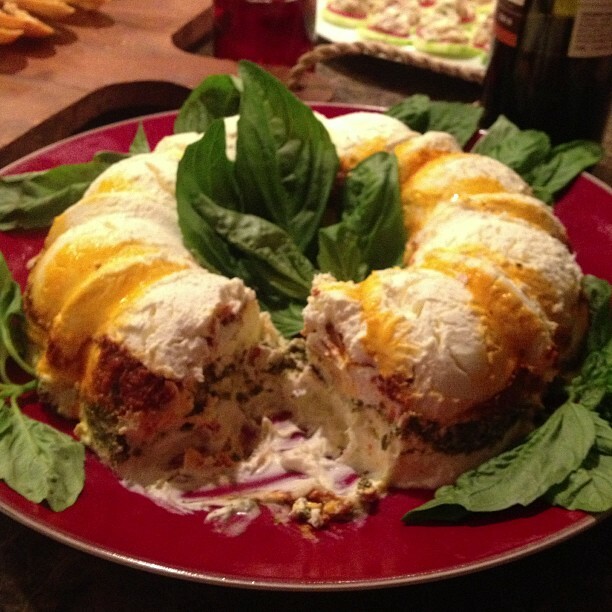 It’s layered with Cream cheese, pesto and sundried tomatoes. I used to mix it up and spread it on bread. It was SO YUMMY!! A few days ago, we were invited to an “appetizer and game” night. I was going back and forth between making empanadas, baking a savory cheese and making this torta. Well, the torta won, because of time. If you’re layering this torta “upside down” as pictured, spray Bundt pan with pan spray. Spread 1/3 cheese into bottom of pan. Layer tomato mixture onto cheese. For the next layer: spread 1/3 cheese on top of sun dried tomatoes. Next layer: Spread pesto on top of cheese, and finish torta off with the remaining 1/3 cheese. Top (the bottom) the torta off with the pine nuts. Place Bundt pan in the freezer for 3-4 hours, or over night. To serve, flip the torta over onto a serving plate, and garnish with fresh basil. Unused portions of the torta can be frozen and used at a later date.